When Marty arrives in 2015, he walks down an alley, the clock tower directly ahead of him. As he turns the corner, you can see the UNIGLOBE Travel location on the left of the screen. UNIGLOBE Travel is one of the first stores that Marty McFly sees as he walks into Hill Valley in 2015. When Marty arrives in 2015, he walks down an alley, the clock tower directly ahead of him. As he turns the corner, you can see the UNIGLOBE Travel location on the left of the screen. A minute later, after Marty is "attacked" by the hologram shark from Jaws 19, he turns to face the UNIGLOBE locations again. It is then seen at various times throughout the hoverboard chase scene. Back in 1989, the producers of the movie series were designing the set for Hill Valley in 2015. They wanted to show the future of various industries, as you can see from the automated gas station. 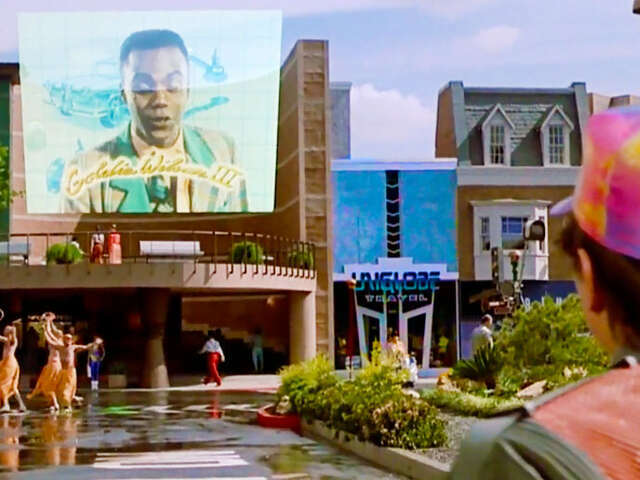 The producers approached UNIGLOBE Travel about being featured in the Hill Valley set. The 1955 and 1985 sets featured Ask Mr. Foster Travel Service - a storied name in the history of travel. UNIGLOBE Travel was pleased to be participate to represent the future of travel.